If you are looking for the best things to do in Brighton England, you’ve stumbled on the right blog post. Without doubt, Brighton is an interesting place to visit and is no stranger to fame. In Victorian times, the Prince Regent was responsible for Brighton’s reputation as ‘London-by-the-Sea’. Later, in the 1930s, Graham Greene chose the city as the setting for his famous novel, Brighton Rock. Then, in 1974, the Swedish pop group sensation ABBA won the Eurovision Song Contest at the Brighton Dome with ‘Waterloo’. However, on a more personal level, Brighton is also a city I know well as it’s a 25 minute drive from a rural Mid Sussex town which has been my home since birth. My childhood and teenage years were spent exploring Brighton long before it was granted city status (with its neighbour Hove) in 2000 by the Queen. Since then the city has continued to thrive. Brighton still retains much of its traditional seaside charm but has grown into a uniquely vibrant and diverse community which reflects modern society. In 2018, its beaches were once again awarded Blue Flag status. 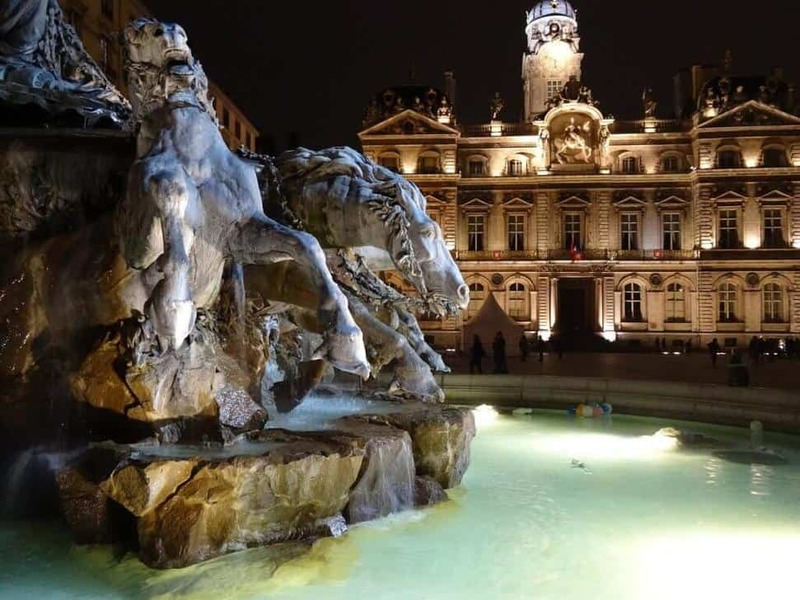 The city is also frequently voted as one of the top 10 city beach break destinations in the world thanks to the traditional daytime seaside fun on offer and its lively night scene. Brighton is also known as one of the country’s top destinations for restaurants and bars. Brighton is a popular seaside city on the south east coast of England nestled behind the South Downs. Brighton is found between the town of Worthing (14 miles to the west) and Eastbourne (24 miles to the east). 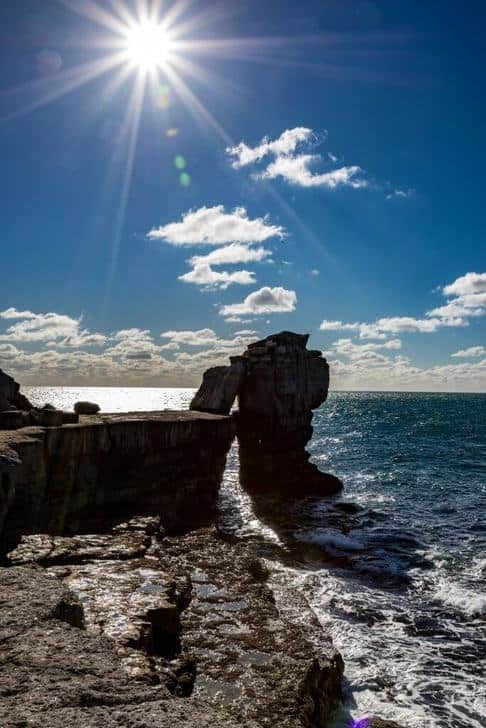 This seaside city is also located approximately 50 miles south of London and is easily accessible by road, train and bus. In 1997, Brighton and its neighbour Hove were joined to form Brighton and Hove. Brighton and Hove was granted city status by the Queen as part of the country’s millennium celebrations in 2000. Brighton is approximately 50 miles south of London. By car, Brighton is an easy 2 hour drive from the centre of London via the M23 and A23. Alternatively, a direct day trip from Brighton by train will take approximately 1 hour and 15 minutes. Trains to Brighton depart regularly (every half hour) from London Victoria railway station. You can also take a train to Brighton from London Bridge or London Blackfriars. 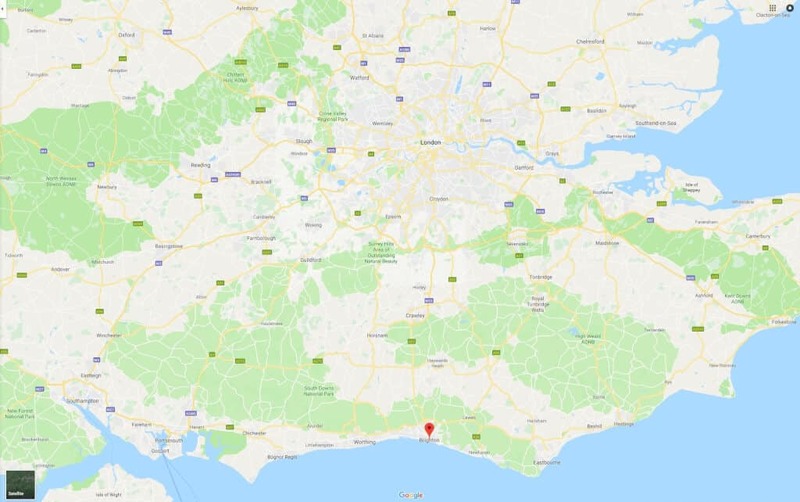 A cheaper way to reach Brighton is via National Express coach from London Victoria Coach Station to Brighton Coach Station but the direct journey lasts just over 2 hours. So, once you arrive in the city here is our selection of the best things to do in Brighton England. The Royal Pavilion looks like an oriental palace which is somewhat out of place in an urban English city. However, this building was built as a seaside pleasure palace for the Prince Regent (George IV) who later became King of England. Suffering from ill health, it was suggested that the Prince Regent should spend time by the sea to take advantage of its healing properties. 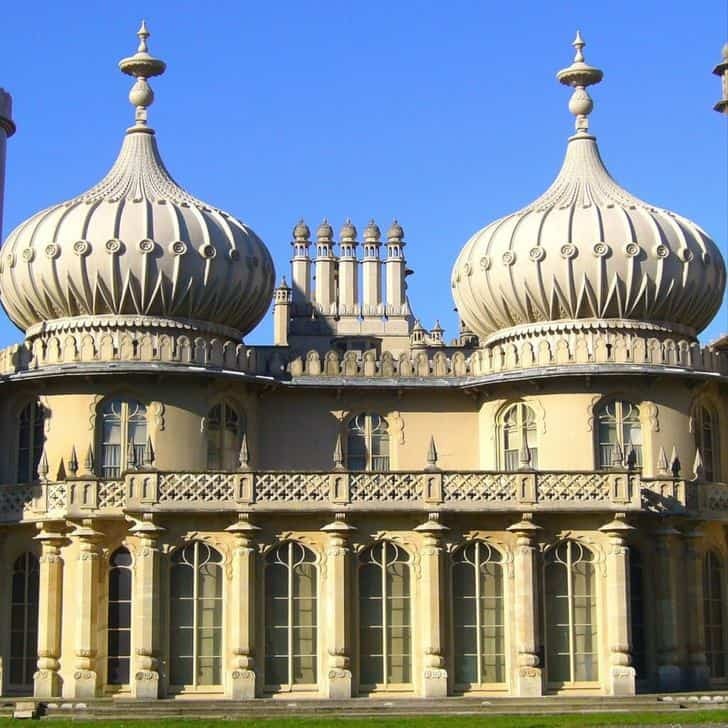 As a result, architect John Nash was charged with designing the Royal Pavilion as the Prince Regent’s seaside palace. 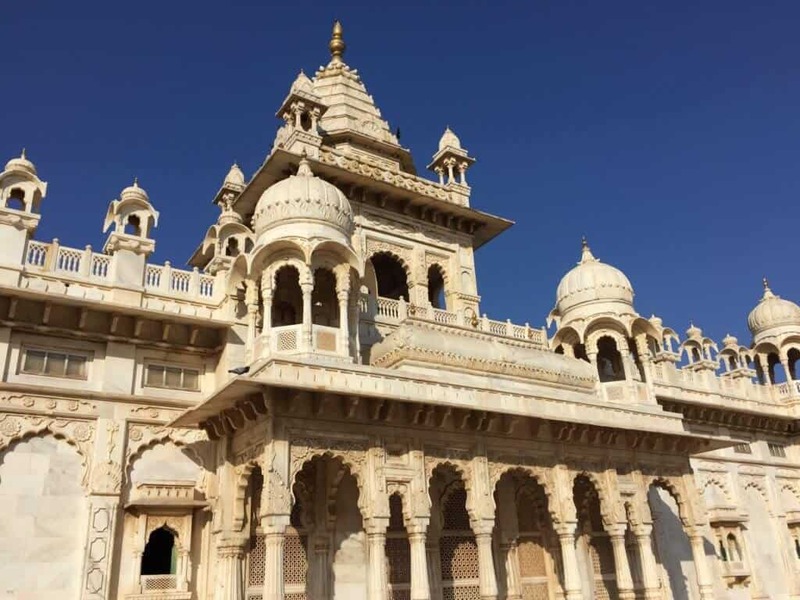 The Royal Pavilion was completed in 1823 and is wonderfully reminiscent of India. The Prince Regent’s frequent visits led to Brighton being dubbed as London-by-the-Sea. No visit to Brighton would be complete without a visit to the Royal Pavilion. 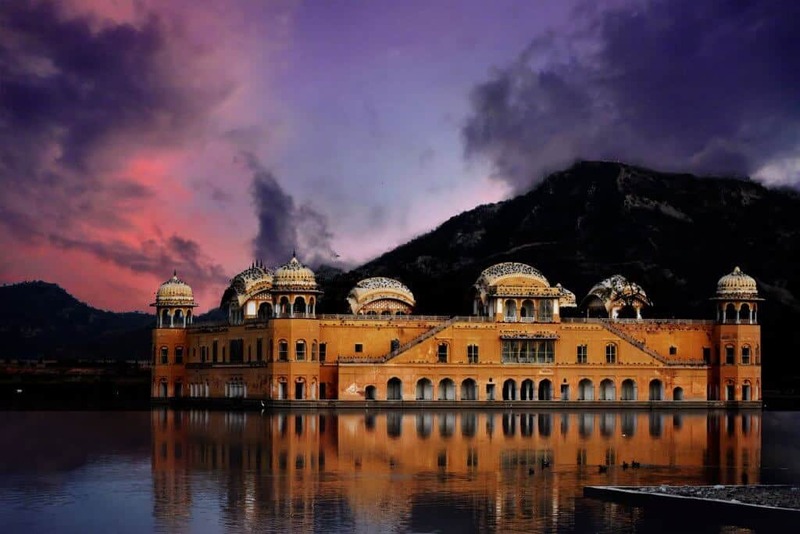 Enjoy the oriental architecture and learn more about its history. Did you know that the Royal Pavilion was later used as a hospital in World War I? The palace is also set in gardens which are attractive in the summer months. Afternoon tea Brighton Pavilion is served in the Royal Pavilion tearoom which has been recently restored on the upper floor. The tearoom overlooks the Royal Pavilion gardens and it’s lovely to sit on the balcony in warmer months and enjoy the sunshine and traditional English tea. If you are visiting the Royal Pavilion from the beginning of November to mid-January, be sure to have fun on the Royal Pavilion Ice Rink. This Christmas, we spent some great family time ice skating in front of this beautiful building. Check out the Royal Pavilion website for ticket details and opening times. If you want to visit for free, look out for details of the annual free day! If you’re lucky, your visit may coincide with this date! On Madeira Drive, about a 10 minute walk from the Royal Pavilion, is Brighton Pier which is also known Brighton Palace Pier. This Victorian pier is 1,722 feet long and is reputed as being one of the finest piers ever built. Whatever the weather, Brighton Pier is one of the best Brighton things to do with kids regardless of their age. Who can resist staring through the wooden planks at the sea below whilst munching on a pink stick of Brighton rock, licking a 99 Flake ice cream or enjoying fish and chips? 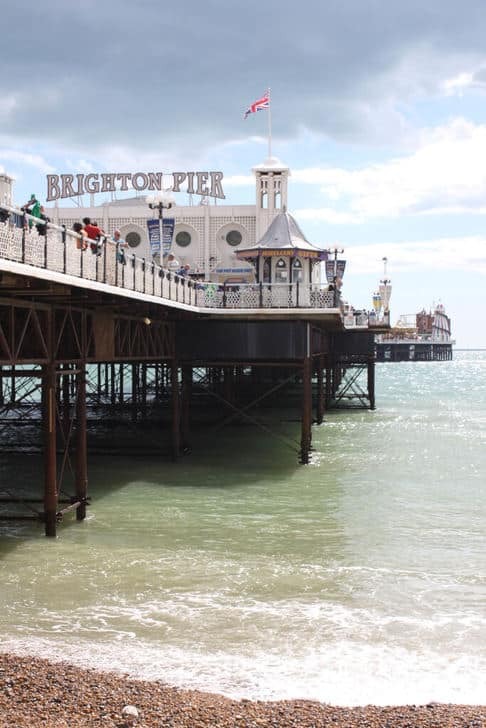 The pier is a haven for amusement arcade lovers but other things to do on Brighton pier include the rides at the far end which include traditional fairground favourites like the helter-skelter, dodgems and ghost train. Brighton Pier entry fee is free. However, you can buy a wristband at the pier to save over 25% on the rides and attractions. Right on the seafront opposite Brighton Pier is the oldest aquarium in world which was finished in 1872. When I was young, this aquarium was the Brighton Aquarium and Dolphinarium. Fortunately, the dolphins are long gone and today children can enjoy getting up close to other marine animals in Brighton’s fun and educational Sea Life Centre. However, what is truly unique about this aquarium is its setting. The tanks and exhibits are nestled among striking Victorian architecture which you will not see anywhere else. Adjacent to the Brighton Sea Life centre is the Brighton Music Tunnel. The tunnel runs from the Sea Life Centre entrance to Brighton beach under Madeira Drive. The recently refurbished tunnel is a great way to avoid the traffic but the main attraction is the portraits of pop artists recognised in the Brighton Music Walk of Fame on the Palace Pier and street art by the street artist, REQ. 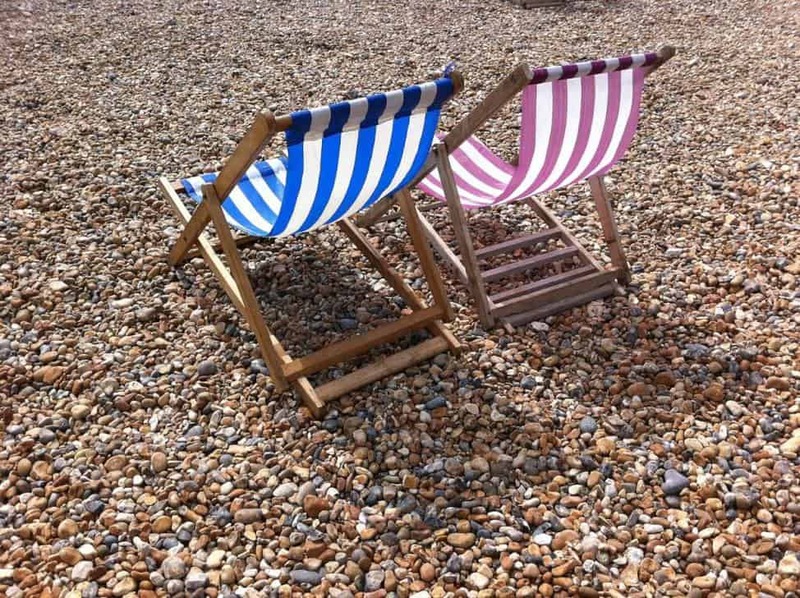 A Brighton beach day trip is perfect for families and couples alike. Not only are there many places to visit in Brighton, but Brighton Beach is also a Blue Flag pebble beach which has safe shallow water. Brighton Beach also has a great boardwalk with bars, restaurants, clubs and cafes which cater for daytime visitors and those seeking to experience Brighton nightlife. From Brighton Pier towards Brighton Marina, there are also Victorian arches which are in the process of being renovated and used as commercial spaces. Interestingly, Brighton was the first place to open a naturist beach in the UK back in 1979. This beach is located to the east of Brighton close to Brighton Marina. Given the British weather, it’s not for the faint-hearted! Imagine stepping back in time to the Victoria Era! One of the fun things to do in Brighton is the Volk’s Electric Railway which was opened in 1883. It is the world’s oldest operating electric railway. The railway is open from Easter to the end of October and trains travel from the Aquarium to Black Rock (near Brighton Marina). Trains run every 15 minutes and a return journey lasts 30 minutes. If you want to take the Volk’s Electric Railway to Brighton Marina (for shops and restaurants) rather than walk, the journey lasts about 12 minutes. This is a good idea if the kids’ legs are tired! You can buy tickets opposite the Sea Life Centre on the beach. Brighton Marina is the largest man-made marina in Europe and spans across 127 acres. In addition to walking along the boardwalks and admiring the boats moored here, there are plenty of shops and restaurants to visit. Whilst you are at Brighton Marina, you can also watch a film at the eight screen cinema, try your hand at ten-pin bowling or play glow-in-the-dark mini golf at Globalls. Parking at Brighton Marina is free! If you are looking for more shopping and places to eat, back in the centre of Brighton are the historic Brighton Lanes. These are a unique maze of twisting alleyways and passageways close to the seafront which are full of funky restaurants and cafes, plus independent shops and boutiques which sell clothes, antiques, jewellery, gifts, vintage items and much more. The Lanes were once the heart of the fishing town known as Brighthelmstone and today form the city’s historic quarter. Make sure you find time to explore the Lanes and if you feel like more fun stuff to do in Brighton, head to Lucky Voice at 8 Black Lion Street for private karaoke rooms which are perfect for friends and family. Slightly to the north of North Street and to the east of Queens Road which runs to Brighton station, you will find North Laine. Here, you will find a community of small and diverse shops and independent traders. The North Laine area mainly covers Bond Street, Gardner Street, Kensington Gardens and Sydney Street. To find the North Laine area, cross the road from the Brighton Lanes and walk along Bond Street and turn into Gardner Street. Gardner Street is pedestrianised at weekends and is home to the Komedia (a well-known live music and Comedy Club). Another part of North Laines is Kensington Gardens which is a narrow pedestrianised street. Sydney Street is also pedestrianised at weekends. Don’t forget to explore other side roads in the North Laines. Who knows what you might find? This whole area offers an eclectic mix of places to eat and shop for fashion, jewellery, art, flowers and plants, gifts, crafts and the list goes on. It’s a truly unique area of Brighton and has a cool vibe. If you love beer, vinyl records and pizza, you will love Dead Wax Social. This restaurant/bar is found in the heart of North Laine at 18a Bond Street. It’s open from 12pm – 2am (3am Thurs-Sat) and only plays vinyl music. Enjoy the nightly DJs and sample craft beer and pizza made from fresh dough with meat, vegetarian and vegan toppings. 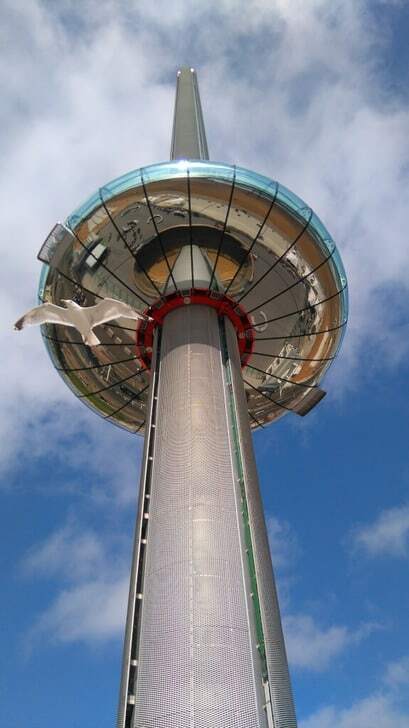 Back along the seafront to the west of the pier is the Brighton i360. At 450 feet high, this giant glass viewing pod gives you spectacular views of Brighton, the South Downs and surrounding coastline. Other activities to do in Brighton could include a visit to one of the many permanent, regular or pop-up markets in the city. The Open Market on London Road is home to fifty of Brighton’s most talented and knowledgeable local producers and creators. This market has a strong focus on fresh produce, nutritious prepared foods and ethical products. 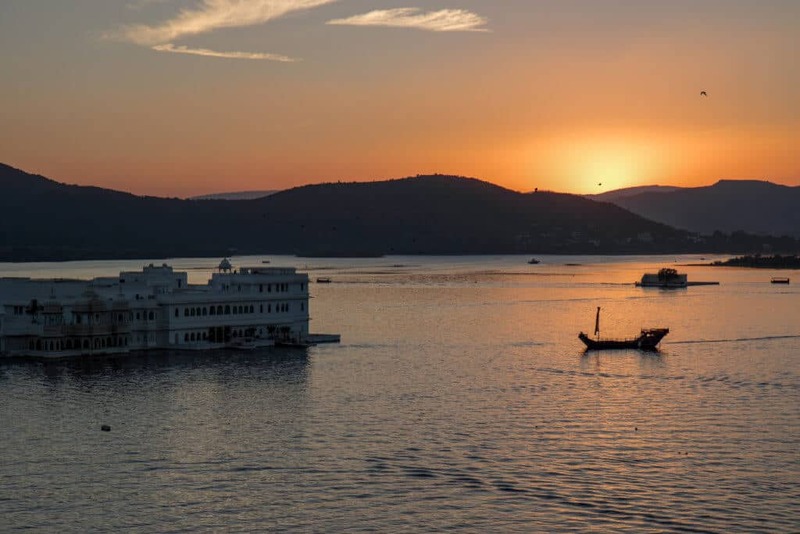 Furthermore, it sells a wide choice of locally made fashions, crafts, hand-made jewellery, children’s clothes and toys, home wares and furniture, world foods, garden goods and more. For those seeking vintage markets, head back to the North Laine. Above Snooper’s Paradise is the Snooper’s Attic which sells many classic pieces. Alternatively, Kemptown Trading Post (to the east of the Royal Pavilion) is an eclectic and bohemian market which sells antiques, collectibles and furniture. Every Saturday in the North Laine, you will also find the outdoor Upper Gardner Street Market which is open from 7am – 5pm. Brighton and Hove is a leading centre for live music, dance, comedy and theatre featuring headline acts and newly emerging talent. Whilst the Brighton Dome was built by the Prince Regent as a stable block, it is now a leading arts venue. Why not check out who is appearing at the Brighton Centre, Brighton Dome or Theatre Royal during your visit?